Policy frameworks of the IMF, the World Bank, and the EU are discussed in order to come up with criteria of macroeconomic and financial stability and sustainability for Future Member States of the EU (candidate and potential candidate countries). 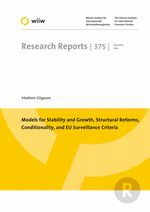 The key deficiency of the EU policy framework is that it lacks a short-term stabilization policy model and instruments for adjustment, such as the IMF. It also lacks an appropriate model for investment support, though not necessarily the funds if not the instruments. The paper suggests a set of criteria for surveillance.